Print both training resources as a PDF. Going over the curriculum, schedule, and policies. Having the pastor deliver a biblical “pep talk." The truth is that planning and pep-talks are what pass for "training" in a lot of churches, and are perhaps why actual training has fallen on hard times and attendance is low. And it gives both teachers and leaders the opportunity to share their insights and advice. Yes, you may need to add your bit of planning, policy, and pep talk; but leave that "stuff" for the end of the event (or a handout) so it doesn't crowd out the opportunity for real sharing and real training. After a very brief introduction of today's agenda and the leaders, get right into the Teacher Be-Attitudes activity. Avoid "going around the room" and putting people on the spot to introduce themselves. They'll learn this soon enough. (Nametags are a good idea, though). Have everyone find a partner in the following manner. Invite the teachers to form a line based on how many years of Sunday School teaching experience they have. Most to the right, least to the left. Then assign pairs by matching the most with the least experienced teacher until everyone is paired up, then have them sit together. a. You have one minute to silently look at all of the Teacher Be-Attitudes and decide which of the Be-Attitudes are your personal answers to the following three questions. After you have picked yours, I'll give you the signal to start sharing with your partner. The Teacher Be-Attitude that is one of your strengths. The one that is your weaknesses, or that you'd like more help with. The Teacher Be-Attitude you think is especially important or challenging, and why. b. Once you've decided on your choices, turn to your partner and in just two minutes per person share the Teacher Be-Attitudes you chose as your answers to the three questions. Have the person who is wearing the most blue go first. Yes, that's short! But of course you will fudge on time as needed, and there will be time for follow-up. After four or five minutes, tell the pairs to wrap it up in 30 seconds, then reconvene the group to "Glean from the Pair Sharing." Leader: After the Pair-Sharing, reconvene as a group and go to the list of Be-attitudes you have put on display. Ask the group to share their answers. "Let's see which Teacher Be-attitudes you chose as your strengths, weaknesses, importance, and why." Circle and "Keep Score" of which Be-attitudes seem to resonate with teachers. It's not important that every single teacher shares every single answer. Mark up the list noting which Be-attitudes teachers seem to have chosen the most. Zero in on the tough ones, asking for advice from the group, and interjecting your own insights. Note the Be-attitude(s) that people didn't seem to choose, and ask why. Keep it moving. Not every discussion point needs a resolution today. Also note that one of the "Be's..." is not complete. Ask if anyone created their own "Be" and ask them to share it. If you have time, or as you listen to participant sharing, write in possible completions of that final "Be." Preparation includes prayer and immersing yourself early in the lesson scripture. What preparation reminder works best for you. Dependability includes being there when you don't feel like it. How does it also mean being there for another teacher? a student? a parent? What does "on time" mean in terms of our schedule? How does "being on time" relieve preparation and help you focus on kids? "Be an example" of what? Are you the Bible they read? Are you the Christ they encounter? Where else in the church do they see and learn from you? What does it mean to be "creative"? Is creativity limited to the "activity"? What about being creative in your welcome, approach to Bible reading, reflections, and prayers? Why act out the insights? Here's a list to share with your participants AFTER the skits. We learn better and remember more when we move, laugh, and share in creative ways. It models a great discussion technique every teacher can use with her students! Acting together builds teamwork and breaks down barriers. It creates teachable moments. Short improvisational skits present an opportunity for the teacher to prime her students with suggestions and to follow up the skit with insightful comments. Standing in a circle, have participants pick a "Be-Attitude" they need help with and form it into a one-sentence prayer request: "Holy Spirit, help me be...."
Following that requesting-prayer, have each form a thanksgiving prayer, "Holy Spirit, thank you for being...."
Get maximum attendance by inviting every teacher to use Doodle.com’s free scheduler to decide on a date and time everyone can attend. Set up your space to be comfortable, and in a way that participants can easily see and interact with one another. Limit planning and policy, such as "The Child Policy Talk," to just a few minutes toward the end of the event. Put details on a handout you can quickly emphasize and they can read later. Put in writing things that can be read and that do not need (much) discussion. Hand out all the papers at the end of the time so they aren't a distraction. Make sure the pastor is part of the event, but tell him/her that you want him to attend as a participant –interjecting insights and appreciating attendees in a personal way. If you want them to provide some "biblical insights for teachers" let them do so as a follow-up to all the training --as what they might share should reflect what they've heard. Take photos and videos with your cell phone and share them so that teachers who missed out and other church members can see what a good time you had and what a great job you’re doing! 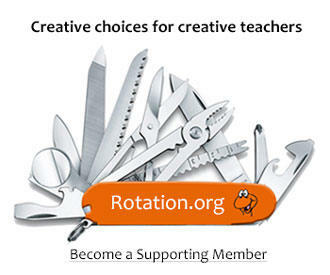 Create a handout of "resources" including Rotation.org, key pages from your curriculum (such as the overview), a copy of a multiple intelligences illustration, and any favorite teaching resources you may have collected in the past. Using random fact-matching to assemble pairs and decide who should talk first reduces the anxiety some people feel about "being picked or rejected." It's also a great way to get students to expand their circle of relationships beyond their usual friendships. Notice the progression from silently thinking to pair-sharing, to whole group sharing in this exercise. This allows shy students to warm up and speak where they are most comfortable. The progression to group level discussion allows the teacher to first hear what students are thinking and lets students hear from other students. This also takes the pressure off of the teacher to "produce" and gives them the opportunity to respond to student questions and insights, before introducing some conclusions of their own -or that of the lesson plan. The time-limits not only keep things moving, they encourage participation "before time runs out," and keep certain talkative folks from dominating. Create an additional education event "About Children"
Create another "training event" to address important issues with experts covering the following topics. In some churches, attendance at such "training" is mandatory. Recognizing and dealing with behavioral issues and discipline. Child developmental stages and strategies. Multiple Intelligences and Attention Spans, best and varied learning practices. Print both this training resource and our Lampstanding training article as a PDF. Thank you! I was trying to do that, but my computer wasn't cooperating. RevCJY just copy the text and images with your mouse and paste into a word processing document and print out for your team. That way you won't have all the headers from the site. Let us know how it goes with your training! This is great - how do I print it for my team? Love this and love the bees! We actually have a stuffed bee from a former curriculum that we use for the younger kids when we teach the Beatitudes. That could be your stuffed object to get people talking! I serve on our Conference Children's Ministry Team and we've been talking about ways to reach out to our smaller churches to equip them. Offering this training event would be so helpful! I know I am guilty of gathering the teaching team for meetings to pass along info that can be given in writing and to show them how to use the smart tv. The gatherings are not billed as training, but they also aren't particularly well-attended (so I have to meet with people individually to explain new stuff). As a volunteer team leader, this looks like a useful training that will bring our teaching team together for some good team-building discussion! And the suggestion to use doodle.com to find a time slot that works for all (or most, and I can choose which "most" most needs to be there .... . And more importantly, as a volunteer team leader, this looks like a training that is already planned and that I can execute with little effort once I have gathered the team. Thanks, Neil and Heidi, for this very practical blog posting! !